"You better realize who you're talking to. You aren't worthy of my captain's time!" HEIGHT AND BUILD: 5'11", muscular but doesn't look it. With a legendary resting bitchface, Angelo looks like he is nothing but trouble. He is nearly sheet-white, and burns easily. He keeps his hair meticulously perfect, fluffed over to one side. How he achieves this is an utter mystery. His scowl is legendary. It is rare to find him when he is not looking like everyone around him is unworthy. He keeps himself fit, with a handsome frame and a rather strong jawline. He is fond of dressing in tealy-blue and gold, fancy and formal. There is no sense of 'informal' to the public eye, he dresses in his finest and nothing less, even during Threadfall. How he keeps himself utterly immaculate in any condition is probably some sort of otherworldly power. Yes, Angelo is hyper-devoted to his captain, following the man around like a loyal dog. He regards the man as his everything, and would gladly throw himself into a torrent of Thread to protect him. He loves the man more than anything in the world, as much as he loves his dragon. 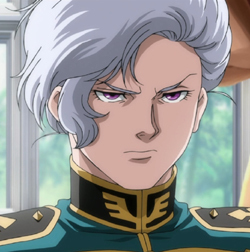 Of course, when not following him around and glaring at anyone who dares even speak to the man (because clearly they aren't worthy of his time), he is an intelligent tactician and can be a valuable asset if asked to assist with a task. However, he's still a bitter person, and anger is his go-to response to most things. He is a hard person to get along with unless you know just how to speak to him. Come Threadfall, he is utterly ruthless. Everyone comes home in one piece or he goes out and makes sure they do, even if he has to drag their dragon back to the healers himself. Born into a family who wanted nothing more than a child, Angelo's early life was a perfect dream. His father and mother loved him dearly, and despite his unusual appearance and how much care he needed, he found little to complain about as he grew through the Interval War. The little cothold he grew up in heard only whispers of raids, and Angelo thought for a long time that he would never have to face the attack of dragons and whers. Of course, this was until he was 16, and an attack came. Fire, brimstone, and chaos. Angelo's father was killed in the raid, and his mother was not the same afterwards. Angelo no longer felt safe, with nowhere to go as his mother began to court other men, and the one she fell for was an incredibly abusive man. Suffering numerous beatings and verbal abuse, Angelo tried to reach out to others of the hold, but could find no help. He was a curse, one said. He brought this on himself, more said. To find people who were once so welcoming suddenly reject him, Angelo grew angry and bitter. He wanted to see the dragons in the sky again. He wanted to see them come and raze the hold to the ground. It was only a few months after the raid and the beatings that Angelo's mother killed herself, either out of grief or some worse response, he was now alone. That was all he could take, and he was all set to leave the hold when once again, dragons came. This time, however, they were not here to raid. Fort Dragonriders had come to Search, and a great, reddy-bronze fixed his eyes right on him. It was an epiphany, Angelo's eyes fixed on the blond, broad-shouldered rider as if he were looking upon Faranth herself. There was nothing that would make him stay, and he nearly leaped into the man's arms. Monty of Bronze Sinanjuth, that was his name, and Angelo was head-over-heels devoted. Anything the man asked, he would willingly jump for, always finding time to prioritize his requests between candidate duties. Every time he failed to impress, it felt as though it was a personal affront, and that he was disappointing Monty - affectionately called his Captain. Ekketoth and Izanycorth's clutches came and went for turns before a miracle finally happened. At age 19, a bright, bold blue tore across the sands and found his way right into the albino's arms. That was the start of a new era. All of Angelo's effort to be perfect paid off. Through Weyrlinghood and into graduation as a dragonrider, Angelo strove to be the greatest dragonrider. If he did any less, then he surely would disappoint his Captain, and that was a sin in itself. With the war ending and the Peacekeepers Age beginning, Angelo's devotion never wavered. He would be the best for his Captain and he would make sure that the Weyr was only greater because of their presence. Early Spring 2765 - In the first Threadfall of the Turn, Gearath caught a large mess of Thread to the face. He convinced/forced Angelo to dismount, and then he went Between, leaving Angelo dragonless. Early Spring 2765 - Gold Geara Zulu bonds to a very distraught Angelo. A bright, yellow-gold with average proportions. 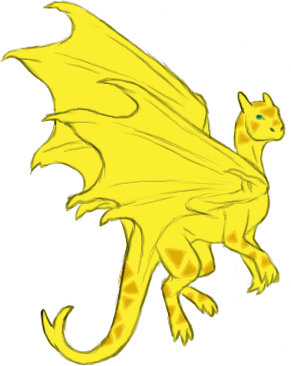 She has darker, orangey-gold markings over her face and back, though otherwise she is not particularly striking or notable. The angriest. Geara Zulu prefers to be Angelo's only protector, to the point of nesting in Monty's hair and biting his ears.